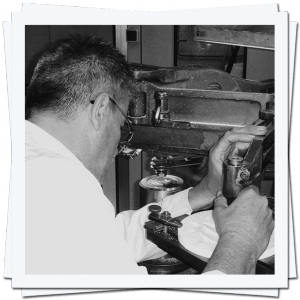 The dies are made in our engraving workshop: steel dies for stamped brass medals, injection moulds for zinc alloy badges and resin moulds for foundry bronze trophies. In this workshop, we implement different metal processing methods according to the artwork to be created. Elements in simple flat reliefs (text and logos, for example) are machined on a CNC (Computer Numerical Control) milling machine. Sculpted 3D reliefs require the creation of a bigger model sculpture which is then reproduced in steel. As for recessed and cambered reliefs, the die necessitates electrospark machining. But whichever the die, the finishing is always hand-made, very often under binocular microscope in order to improve the slightest details and to give the motif all its accuracy, its sharpness and its subtlety. Dies engraving is a key activity in FIA’s profession.